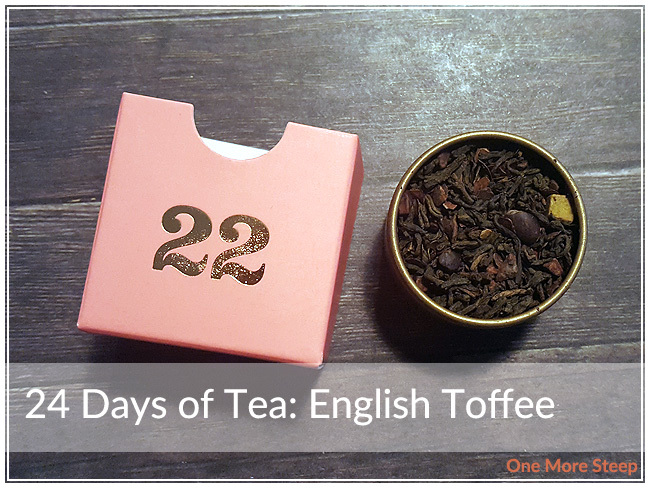 It is day 22 of the 24 Days of Tea advent calendar and I’m going to be so sad when this calendar is done! It’s been so much fun trying all sorts of teas (and discovering new ones that I want to keep a stock of in my tea stash!). Luckily, I have a (huge) backlog of teas to try and review after December 24th that I’m very much looking forward to. English toffee is not a candy that I’m too familiar with, but I’ve had toffee before so I’m assuming it’s fairly similar (please don’t send pitchforks after me if it’s not…). 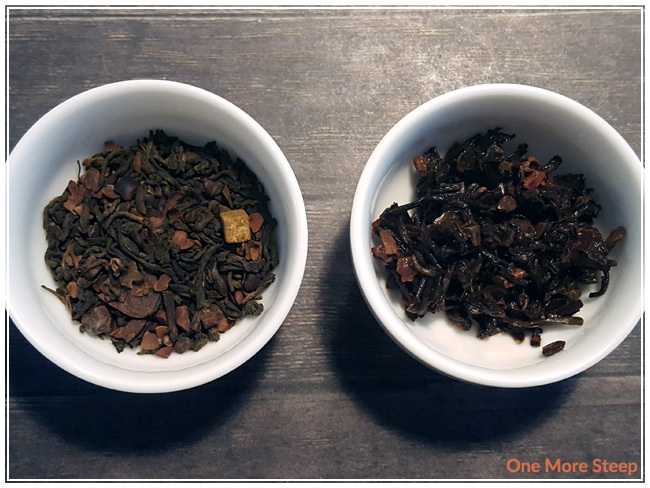 English Toffee smells like sweet toffee candy, and has these lovely earthy notes from the pu-erh base. English Toffee is made up of: pu’erh tea, cocoa beans, cocoa husk, caramel, natural flavouring. For those looking out for allergens, this one contains milk (in the caramel). DavidsTea recommends steeping English Toffee in near-boiling water (90-95°C/194-203°F) for 4 to 7 minutes. I did my first cup for 4 minutes (and the second steep for 5 minutes). English Toffee steeps to a beautiful deep amber colour and has a very sweet toffee smell to it. There’s a thin oil of film on the top (from the oils in the caramel), but it isn’t a very thick layer so it’s paletable. On first sip, I do notice that it has an oily mouthfeel to it, but because it’s not a thick heavy layer of oil, it isn’t unpleasant. The tea itself tastes like chocolate and caramel, so it reminds me a lot of Rolo candies. There’s a slight creaminess to this tea that is quite good, I think the flavour profile of this tea brings to mind ‘hot chocolate’ more than ‘toffee candy’ to me. English Toffee reminds me a lot of instant hot chocolate mixes (which I love and frequently enjoy at this time of the year), it’s just missing a heavier milk component to really make it tastes like hot chocolate, and maybe a handful of marshmallows. 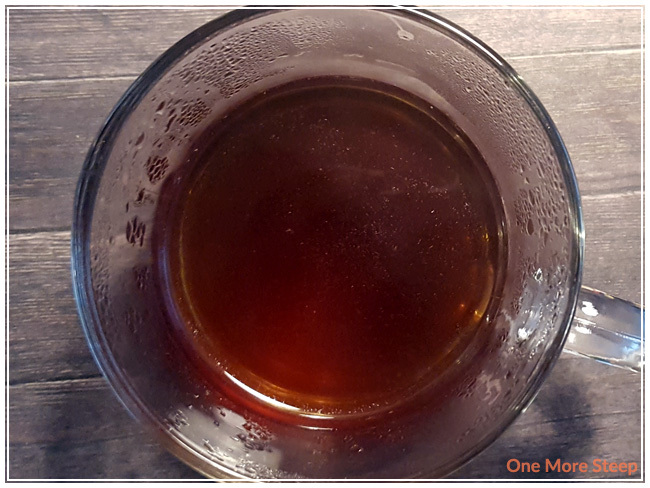 One resteep of English Toffee yielded a very similar cup of tea in terms of flavour, but by the second resteep it was very watery and barely resembled the first two cups of tea. I would say that English Toffee is only good for one more steep. 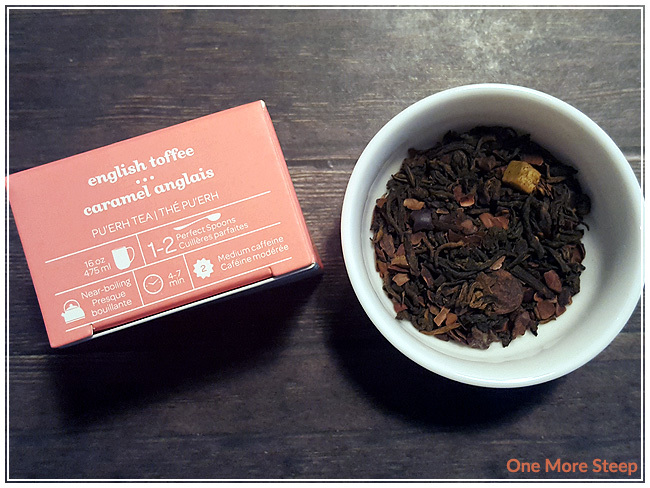 I loved DavidsTea’s English Toffee. There’s just something delightful about a cup of tea that reminds me of hot chocolate (unlike the actual tea named Hot Chocolate, which incidentally also a pu-erh tea and from DavidsTea!). This is an excellent dessert tea that has a nice balance of chocolate flavour with the sweetness, I don’t even mind that the toffee flavour isn’t at the forefront.